I’ll be joining a crew of great writers in Baltimore tonight for another Noir at the Bar! The show begins at 6:30 p.m. at Zella’s Pizzeria, 1145 Hollins St., Baltimore. Admission is free, and the restaurant serves great food, so join us! This is part of a series of Noir at the Bar events called CHILLED TO THE MARROW. 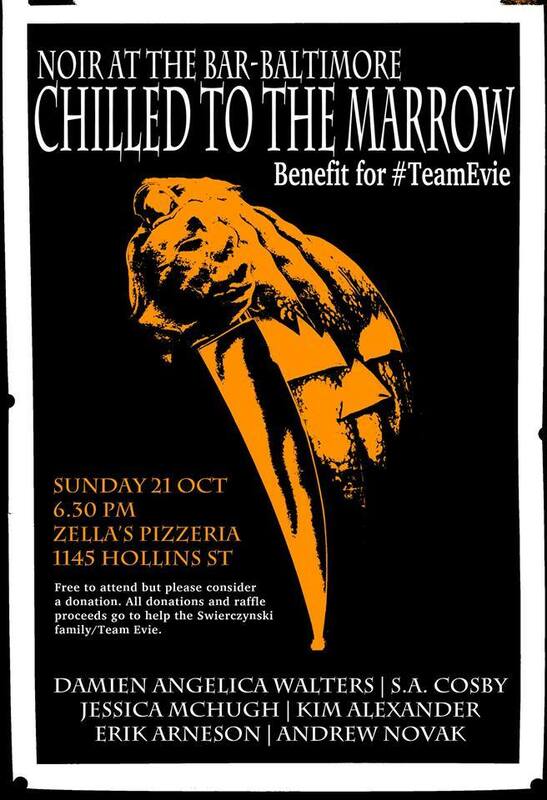 Authors around the world are participating in Noir at the Bar events to help raise funds to cover medical expenses for Evie Swierczynski, who was recently diagnosed with Acute Myeloid Leukemia. Evie is awesome, and she’s the daughter of Duane Swierczynski, author of a lot of amazing novels and comic books. For more information about supporting #TeamEvie, visit this GoFundMe page. And the whole thing is hosted by the great Nik Korpon. I hope to see you tonight in Baltimore! Noir at the Bar – A Great Night in Baltimore! Don't miss anything! Sign up for my email newsletter. Featuring my story "Fortune" about stealing used cooking oil. 17 Games You Can Play Right Now!